Welcome to woodcarving in Lake Placid - this will be the 9th year of the program at Hotel North Woods. 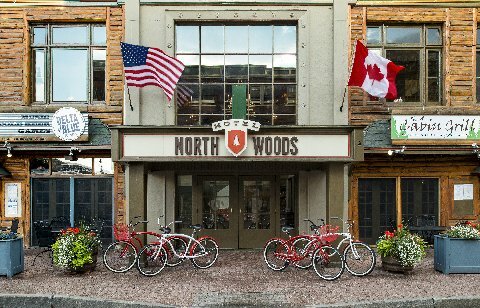 If you have not been to Hotel North Woods in a few years you will be amazed at the results of the completed renovation of the hotel. During the 2019 May and Fall LPWE events there will be a mix of 3, 4, and 5 day classes among the sessions so look closely at each class length. There should be time enough in all classes for most carvers to complete and paint or put a finish coat on the projects without feeling "rushed". Many classes are expected to have a low student to instructor ratio for maximum individual attention. Each class is priced differently and you pay the instructor directly for both instructional fees and blank fees. Some class may be appropriate for novice students where they can get very individualized attention, most such classes will say that. If you are unsure or would like to join a class anyway- feel free to contact Jim O'Dea or the instructor to discuss the class. Class descriptions for the Spring LPWE classes click here. The Fall 1st session LPWE class description here. The Fall 2nd session LPWE class description here. Spring 2019 LPWE Hotel Room Rates - Hotel room rates includes just the Hotel room. The Hotel will NOT be offering meals as the Kitchen will be closed. You are on your own for meals. There are plenty of Restaurants, Pizza and Deli shops close by in walking distance. Reception will be on Sunday night in the Kate Smith room with your Instructor, hotel is not hosting the spring 2019 reception. A free sharpening clinic will be held Sunday from 5pm to 6pm. Jim O'Dea will show you how to use power sharpening equipment and help you with your sharpening. Bring your tools and get them sharpened up before class start. Spring LPWE Hotel Room Costs click here. Contact Brian 518-302-5808 at the Hotel to make your Room reservation. Fall 2019 LPWE Hotel Accommodations Package Plans -one price which includes your room, reception, plus breakfast and lunch each class day is available. Meet and greet your instructors and fellow carvers, with very light snacks and beverages. Hotel management will be on hand to welcome you and provide an overview of the Hotel's history and orient you to the Lake Placid area. There is also an optional spouse/companion reception, and meal plan. Check the Hotel North Woods web site for - Fall package plans, click here. Then contact Brian 518-302-5808 at the Hotel directly to make your package plan reservation. Spring and Fall Commuter Plans for those not staying at the hotel (ie. RV's or from home, etc.) If you are not staying in a room at the hotel, you must have a "Commuter" Plan. For the Spring classes the cost includes just the hotel's class space usage fee. For the Fall classes the package includes the hotel's class space usage fee plus the Reception, and Lunches only, for 3,4,& 5 day classes. Contact Brian 518-302-5808 at the Hotel to make your Commuter plan reservation. Local RV parks include the KOA seen here and State Parks listed here Saranac Lake Islands here and Wilington Notch here. There may be more in the immediate area that I am not aware of, if so please bring them to my attention. Non-Carving Companion Activities: We will coordinate tours and site seeing for the non-carving companions whom wish to go as a group. Let us know when you register for the class with Jim O'Dea if you have someone coming that would be interested. There are many sights to be seen and your non-carving companion will have plenty to do and enjoy. See the many exciting things to do in Lake Placid here. . There will be some carving tools, gouges, knives, ABRANET, gloves, books, Ram rotary tools, and Colewood burners available for purchase during the workshops. Some instructors may have their books, blanks, carvings and tools for sale as well. The Weather at Lake Placid - while always great, details and a 10 day forecast are available by clicking here. Pictures of the 2011 LPWE click here Pictures from the 2017 Fall LPWE can be seen here. News articles about the 2011 event: for 2011 event click here. Lake Placid is an upscale sight seeing destination for your non-carving companions as well as providing a great carving experience for you. Most Carving events are held in locations where there is not much to do for non-carving companions - this will be the exception!! Most carving events are in facilities with minimal room sizes and minimal dinning experiences - this will be the exception! The rooms at the Hotel North Woods are large, suite size rooms,VERY comfortable mattresses and the meals are fine dinning quality. Lake Placid is located in the Adirondack Region of Northern New York State. This region is unlike any other area of the Northeastern United States, larger than many neighboring states, the Adirondack Region is a blend of quaint, friendly villages that are surrounded by millions of acres of forests. The forests are filled with hundreds of pristine lakes and ponds, endless miles of rivers and streams, and the famous Adirondack Mountains. We are known for our picturesque hiking and walking trails, wilderness paddling opportunities, unparalleled winter recreation where the 1932 and 1980 Winter Olympics were held, and year-round Adirondack hospitality. Just a short, easy drive from any east coast metropolitan center, we are closer than you think, and further from anything you can imagine! We encourage you to explore The Adirondack Region web site and our region, and plan your trip. There is so much to see and do in Lake Placid and throughout Adirondacks Region, with so many different areas to visit, plan to come a few days early or stay a few days after, The Hotel will be glad to extend your stay at the same low room rate, just ask for the "extended woodcarver" rate. For a "virtual tour" by boat of Lake Placid click here. For a real boat tour try the Lake Placid Marina 518-523-9704 - Cruise pristine waters on a pontoon boat. Highlights of the $15 (adults) one-hour narrated tour which travels 16 miles and includes good views of the former summer residences of the singer Kate Smith, Victor Herbert and Johnny Weissmuller. The tours are available several time a day, May to Oct. Call for current schedule and pricing (518) 523-9704. For a nature walk try "High Falls Gorge", an eight mile drive from Lake Placid seen here. Hudson Valley Wood Carvers Club,Pleasant Valley NY.